Celebrate Canada's 150th birthday with a 2017 Discovery Pass that allows you access to all national parks in 2017! With the 2017 Discovery Pass, you will have unlimited opportunities to enjoy national parks, national marine conservation areas and national historic sites across the country! You only need one pass for your group or family if you are travelling together. The 2017 Discovery Pass is valid for any group of visitors entering a national marine conservation area or historic site together or arriving in the same vehicle at a national park. If you are travelling within eight weeks, we recommend that you obtain your Discovery Pass upon arrival or pick it up in person at one of these locations. 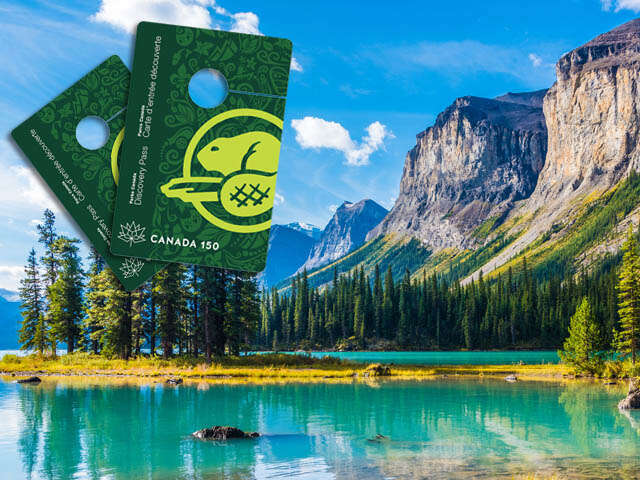 The Discovery Pass ensures free entry only to places managed by Parks Canada. It does not apply to provincial, municipal or private parks, nor to the many historic sites not managed by Parks Canada. Please refer to the complete list of Parks Canada places when planning your visit to take full advantage of the Discovery Pass. The Discovery Pass may not cover activities such as guided tours, parking, and other programs and services. Camping, backcountry overnight use, and accommodation fees are not included with the Discovery Pass. Validity period: January 1, 2017 to December 31, 2017. Display: The 2017 Discovery Pass must be hung from the rearview mirror of the vehicle facing forward, or placed on the front driver side dashboard facing up.